If any bird deserves the accolade, then the crane should be considered the fashion model of the bird world: tall, slim, long-legged, and always elegant. 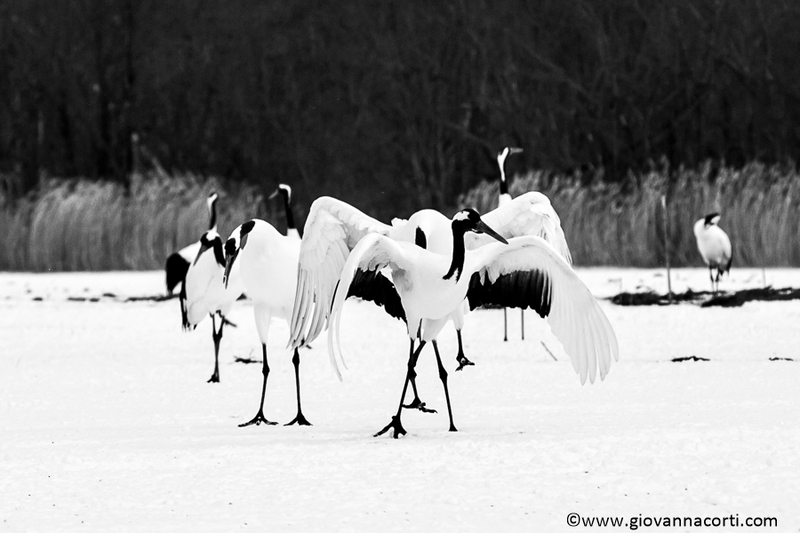 The Red-crowned, or Japanese, Crane is a potent icon. In symbolic form, Tancho, as it is known in Japanese, is the bird of happiness and long life (in fable it lives for a 1,000 years). It is such a popular icon that it defines Japan, almost as boldly as do images of sacred snow-capped Mt Fuji, or the blazing sun on the white background of the national flag. From airlines to sake bottle labels, from wedding kimonos to elevator doors and chopsticks, so many different things are decorated with them. Meanwhile Japan’s innumerable shrines are frequently draped with thousands of origami cranes, like colourful lei. There is a paradox here. Image and reality are often at odds in Japan, and perhaps no more so than in the case of the sacred crane. Although common as an iconic adornment, few people have seen the real thing. Once widespread, this bird, the meat of which was once reserved for emperors, became a prized target for the hastily armed hunters relishing the lifting of feudal restrictions. How many cranes there were prior to their slaughter in the late 1800’s and early 1900’s is not known, but we do know that it was wiped out almost everywhere following the Meiji Restoration (1868). Miraculously, a small resident population survived the hounding of the hunters in the marshes of eastern Hokkaido into the early 20th century. The second blight on the crane’s happiness came with the rapid erosion of its breeding grounds, as a result of rampant land development for agriculture. 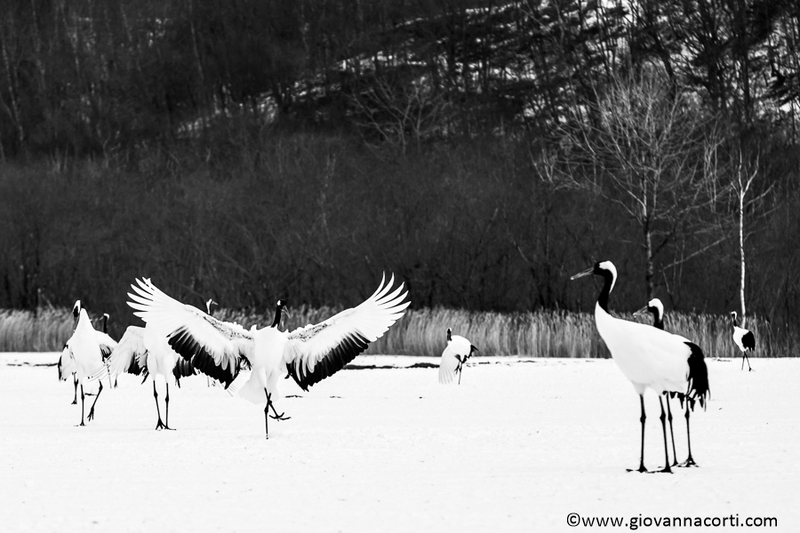 By 1924, Japan’s crane population reached an all time low, with fewer than 20 thought to survive in the Kushiro marshes. Legal protection eventually came with its designation as a Natural Monument in 1935 and reduced persecution during World War II enabled it to recover slightly to 35-36 birds by 1949. In the 1950’s, when residents suddenly awoke both to the plight and the charm of the cranes, provision of food for them in winter was begun, and this feeding helped the young birds survive the crucial gauntlet of winter conditions. 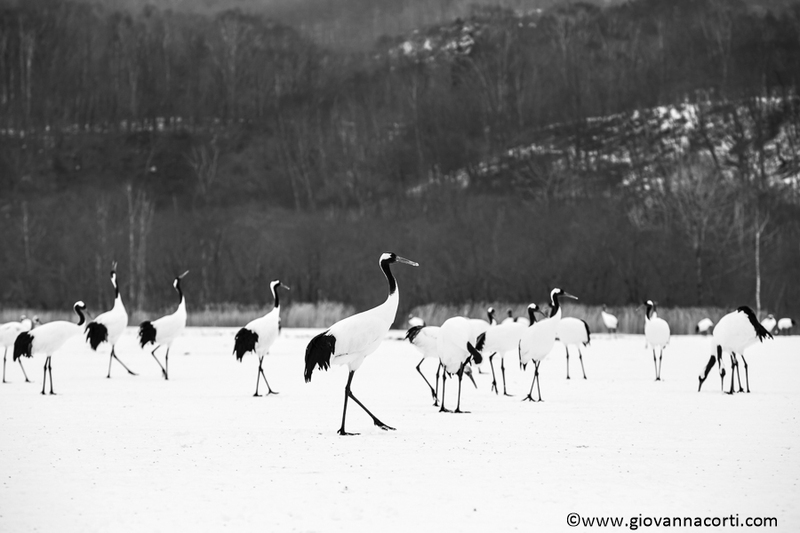 Protected, supported, and with a secure winter food supply the population began a dramatic recovery that has made it the great success story of 20th century conservation in Japan. By December 1959 the population had reached over 150 birds. As people took them increasingly to their hearts, protected more wintering sites and provided food, so their numbers rose further. By the late 1980’s the wintering population exceeded 400 birds for the first time in a century. Almost man-high, and with a 2.5 metre wingspan, Tancho is long-lived, slow to mature, slow to breed. 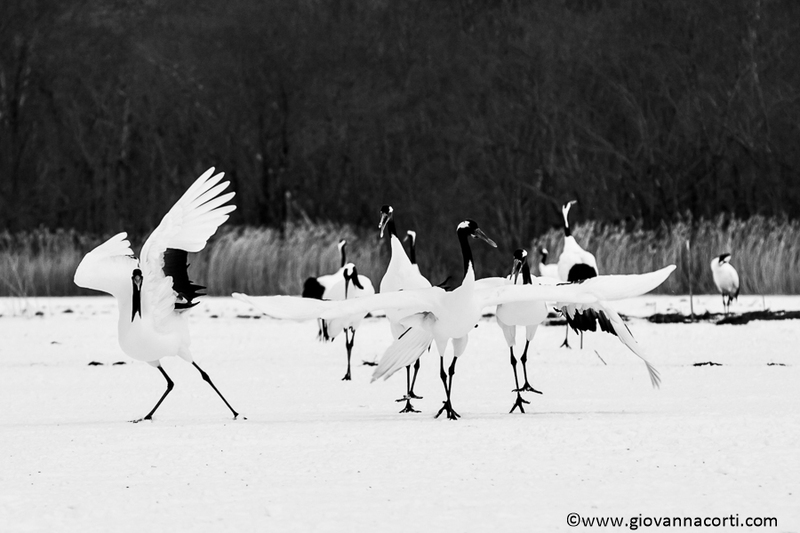 The epitome of grace, their winter courtship displays in the snow are moving to watch, they are like monochrome ballerinas. Only blue skies and their red-crowns bring colour to their wintry world. 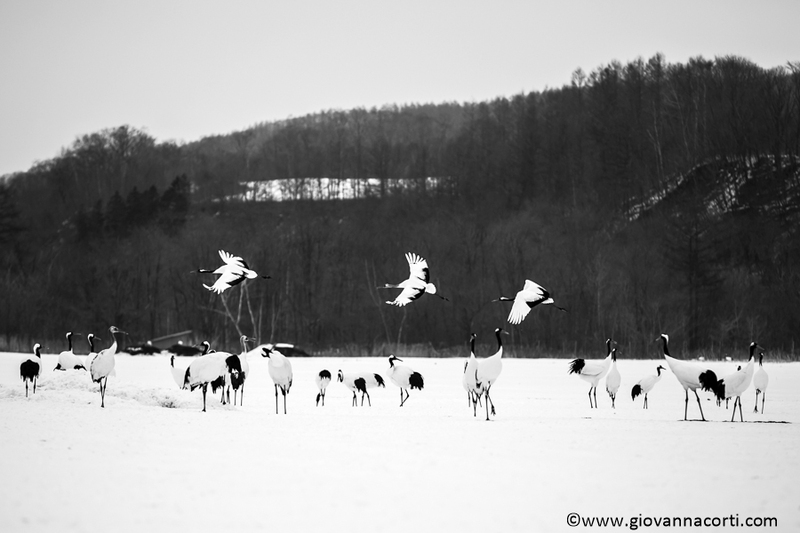 The cranes gather at three major winter-feeding sites north of Kushiro City, two in Tsurui village, and one in Akan village. Each night they fly gracefully off to roost socially in the safety of flowing ice-free rivers (the surrounding marshes and fields are all frozen during winter). 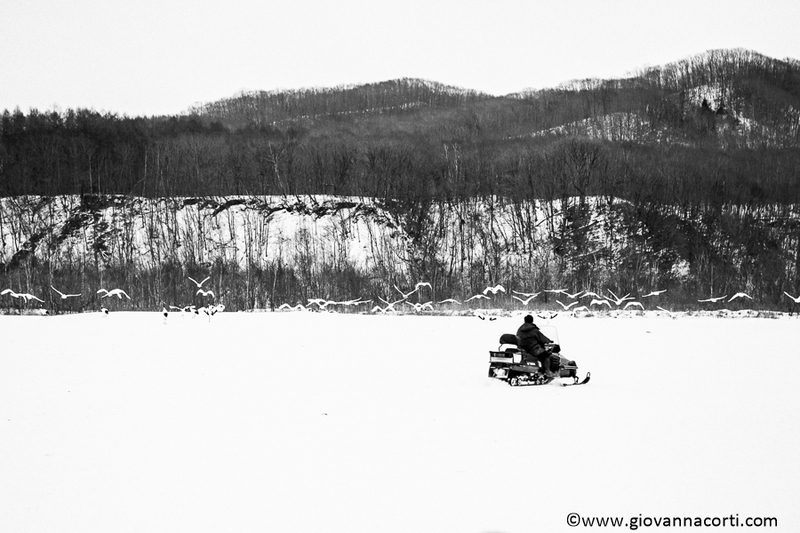 Each day they re-visit the feeding sites where corn and fish are provided for them, and they also forage along streams and marsh edges in search of food wherever the bite of ice has failed to freeze them solid. On late winter days it is a moving sight to watch them calling and dancing to one another in preparation for the breeding season ahead. Come spring they disperse, each pair to its remote traditional nesting territory. In the lush green of the summer reed beds even these tall birds are well hidden, but in autumn, as the waters of the marshes cool, the cranes forsake their breeding grounds in search of other food. The successes of the 1980s continued, the population rise was sustained and conservationists talked of there being first 600, then 700, then an amazing 800 birds. These are long-lived birds, and although devoted pairs produce at most two (often only one) chicks a year, the protection they have been given and the increased survival of young birds over winter has helped drive numbers inexorably upward. It seemed that the cranes were hell-bent on record-breaking. 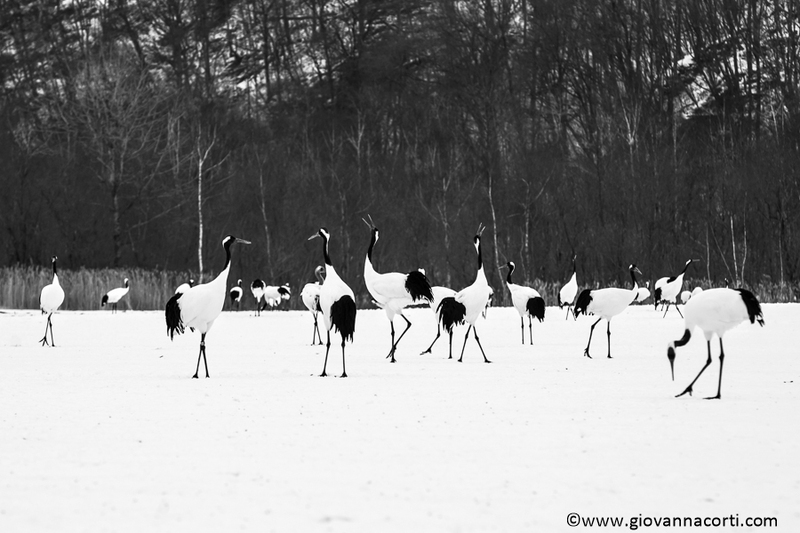 If the crane is a powerful icon for the Japanese, it is an even more powerful entity for the Ainu of Hokkaido. 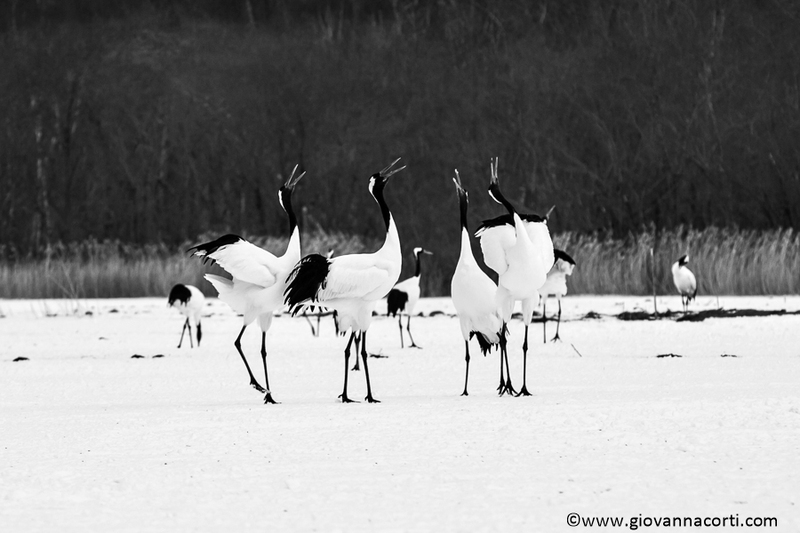 For them the crane is a deity “Sarurun Kamuy” their god of the marshes. 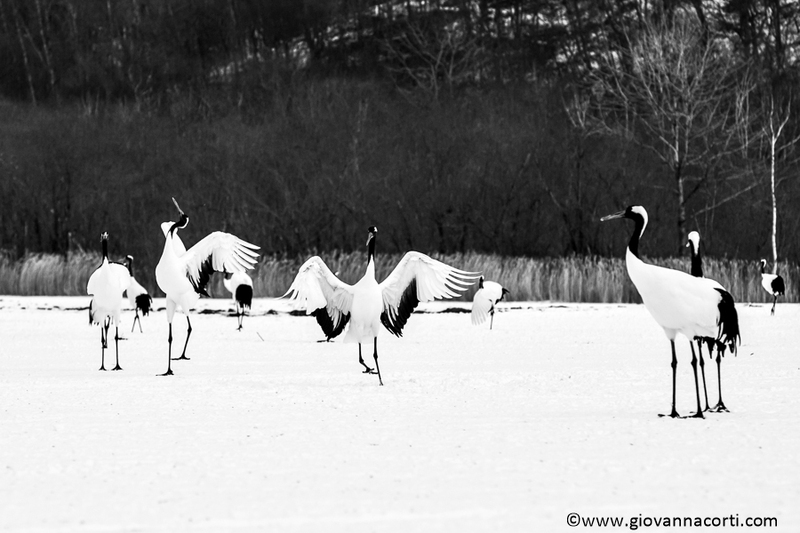 Its cries in spring echo out across the newly thawing swamps of east Hokkaido proclaiming that another breeding season has begun. Early this century the population of Sarurun Kamuy passed a potent milestone – the symbolic figure of 1,000, and now there are about 1,300 in Japan. Quite justifiably, cranes, conservationists, and researchers may all dance for joy in celebration of their long life, their happiness, and their success in rising almost phoenix-like from the ashes of what 100 years ago seemed a doomed population.